Death and taxes are the famous things that Benjamin Franklin said were all that one could be certain of. Sadly, in LA at lease, Moonlight Brewing Co Death & Taxes is anything but a certainty. Moonlight Brewing is located Santa Rosa California and is notorious for its extremely limited distribution, with most of its beer staying in the greater San Francisco and Sonoma areas. Death & Taxes, a black lager, is one of their year-round beers that is supposedly pretty easy to come by if you live up north. Luckily for us, two kegs have made their way down south for our enjoyment. Moonlight Brewing describes it as a very dark yet surprisingly light-bodied Lager beer, crisp and refreshing with no heaviness. Pour is pitch black with a good amount of creamy light brown head which dissipates pretty quickly leaving a good amount of lace. The aroma is definitely malty, with a smokey character and hints of chocolate and caramel. Very light bodied with a lively carbonation, giving it just a slightly creamy mouthful. The flavor starts with a rich smokey malt and a hint of sweet caramel that settles into a slightly bitter dark chocolate and finishes with a dry, mild coffee flavor and just a hint of peat. The aftertaste is a lingering maltiness with an almost scotch-like flavor. This beer has to be one of the best black lagers I have ever had. It brings all the strong malty flavors of a porter or stout but is light enough that you can have few and still be able to walk out of the bar. The only one that could top it for me would be Stone / Firestone / 21st Amendment El Camino (Un)Real, but sadly that was a one time brewing. This beer is currently on tap at Far Bar and will also be available at Verdugo Bar at some point in the future. I really wish this one was easier to come by, but its rarity makes it just that much tastier. 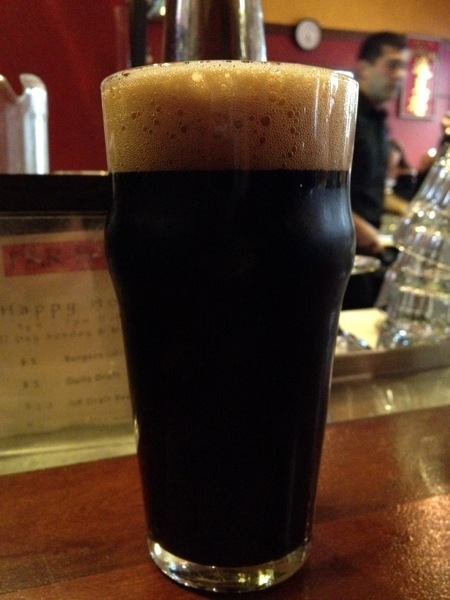 This entry was posted in Read'em And Weep and tagged Black Lager, Moonlight Brewing. Bookmark the permalink.